Interests:fishing, fishing, and fishing, hahaha. used to play every sport, but too many tear ups and getting toooooo old!!!! i might to able to really catch some fish if the wind would lay down just a bit. sitting way off shore and right in the teeth of the wind makes if more than difficult to stay in a precise place and fish 50 to 60 feet deep. despite it all had a decent day. same two lures and most bites in the 50 to 60 ft. range. better ones are deeper and were caught by casting not vertical. Your fishing reports always make me wish I was fishing. Good job and thanks for the info as always. Bo - what size line do you use to help feel the lure in 60 feet of water? I assume you make about a 100 foot cast, peel off line to get it to the bottom? 160 feet of line out to begin with. 50+ yards of line. And when you get snagged, do you get directly over the bait to retrieve it? Just trying to visualize fishing that deep and maintaining contact and feel. 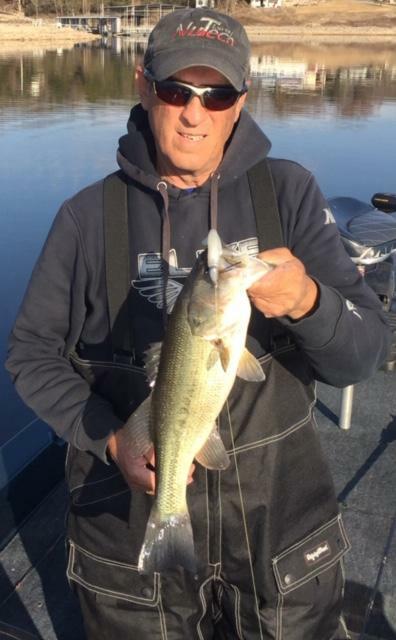 Have you considered a trolling motor with spot lock? Yep, time to get yourself an Ultrex! I can't even imagine what a guy like you would do with that kind of technological advantage. Especially if you had it linked to your electronics. I can hear it now. "Kind of another slow day for Linda and me again. Fished for a little over an hour and did manage to squeak out 150 fish but only 135 keepers. Worse yet only 50 of 'em were 5 lbs. or better. Pretty disappointing but it's just tough out there right now. Should pick back up in a couple of weeks when things stabilize a bit." well, i don't have $2500 to spend on one. poor folks have poor ways. i have cheapo electronics too, but they tell me what i need to know. braid is great for deep water fishing. i am using 20 lb. test braid, and i like hi-vis yellow. you will see many strikes that even on braid you will not feel. yes when casting your lure and the bites are 60 ft. deep, it requires to have a lot of line on the reel. just another reason that the thinness of braid helps. all bites are not on the bottom. this is where you learn to fan cast and work your lure down through the water column or when using a swimmer can count down and reel back. i like to pump mine just as you would a spoon. the GrassJig with a swimmer on it is a real plus when fishing timber. you don't hang up and be ready for one to thump it coming off a limb. fishing vertical, use a 5500 gracia. you have a built in line measure and never have to worry about seeing your lure on your electronics. when the level wind goes from one side to the other, on a normal filled spool, that is 7 feet. simply count your trips and do the match. if you see activity at 50 ft., simply let it go 7 trips and boom!, you are in the zone. very simple. most 20 lb. braids are only a 6 lb. diameter. the thin diameter enhances the movement of your spoon or swimmer when falling, and also helps to reduce the wind drag on your line when it is windy. you would be amazed with mono or floro how wind drag on the line will prevent your spoon from doing its thing when falling and will actually cause the spoon to just slide back tail down because of the tension on the line from wind bag. here is another one that fell to the swimmer at 55 ft. deep. this one was bottom related and bite the first time i pumped up off the bottom. the hook goes through instantly with braid even with a whole lot of line out. that is most likely at least 150 ft. of line. you can not get that type of results with floro. i used to do this with mono and because of line stretch, i had to use a 7'6" heavy action flipping rod to be able to move enough line and set the hook another two or three times on the way in. i now use a 7' mh and one hook set and they are stuck through head.